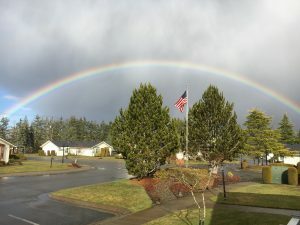 This past weekend Mr. Blogger and I took off with our RV in tow and visited the Columbia Gorge area around Hood River. Our big goal for the weekend was to visit a car museum located in Hood River. We “camped” at Cascade Locks and then had a short drive to the museum. One of the nice things about this whole trip was how close to home it was. A short two hour (or so) drive from our home here in Stillwaters. A nice quick get-way and to such a beautiful part of our country. The following is written by Mr. Blogger. Cars and airplanes are his area of love and expertise and I thought you would enjoy this review of the museum through his eyes. For lovers of antique machinery, there’s a well-kept secret hiding in plain sight in Hood River, Oregon. 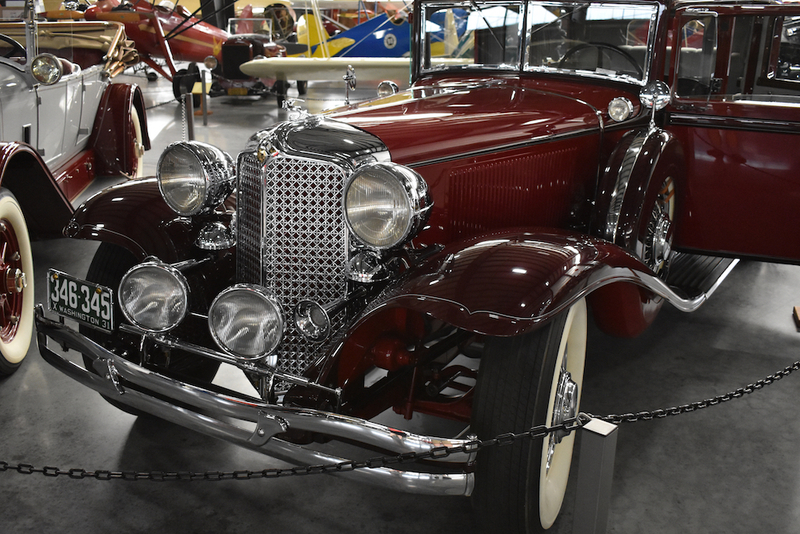 Last weekend we visited the Western Antique Aeroplane & Automobile Museum, one of those, “one day we should go there” destinations on our travel list. Why did we take so long to do this came to mind the first step inside the door. Expecting a nice, small, local museum, we were completely unprepared for more than 300 museum-quality masterpieces filling 3+ acres under one roof. 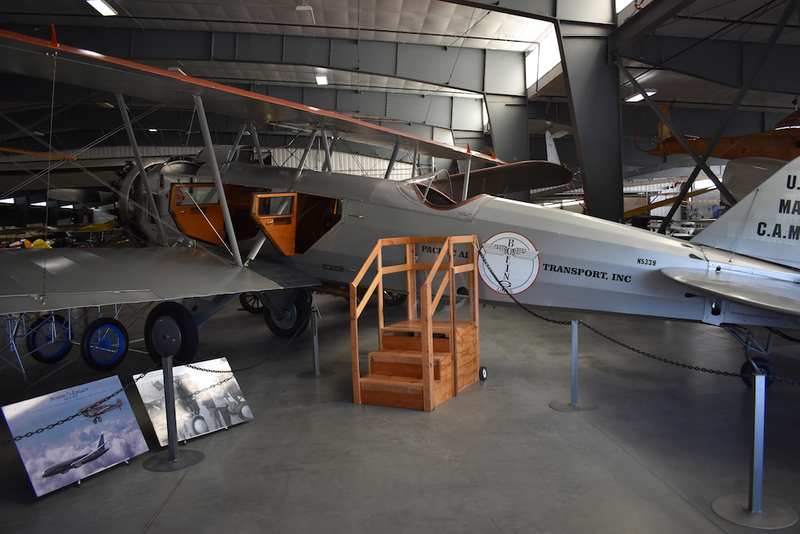 One of 77 Boeing Model 40 aircraft made. This was state of the art in 1928, able to carry 500 pounds of air mail and 4 passengers in closed comfort, while the pilot sat outside behind them. 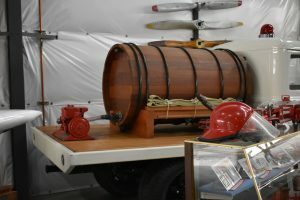 Anything you can imagine that has ever turned fuel into noise and motion is there – airplanes, sea planes, cars, trucks, military vehicles, motorcycles, even a surfboard powered by an antique gasoline-fueled Maytag washer motor. And unlike most museums full of antiques, everything here still runs, still drives, still flies. The sheer size was just the first amazement. I’ve been visiting museums, attending and volunteering at air shows, and reading historical aircraft magazines for years. I thought I had more than a surface-level knowledge of historic aircraft. It didn’t take long to feel like a complete neophyte there. I had never heard of at least a dozen or more airplane companies with products standing in front of me. Bird, Buhl, Fleet, American Eagle, Command-Aire, Funk, and Franklin were just some of the names mixed in with the more familiar Cessna, Boeing, Piper, and Waco. My long-standing car-guy credentials were trashed just as quickly. 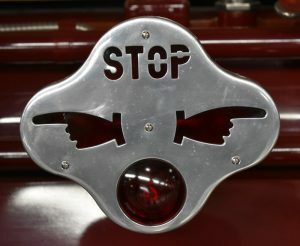 In and among the Chryslers, Chevrolets, and Fords, you see the pride of companies like Everybody’s Motor Buddy, King Eight, Scripps Booth, and Republic. 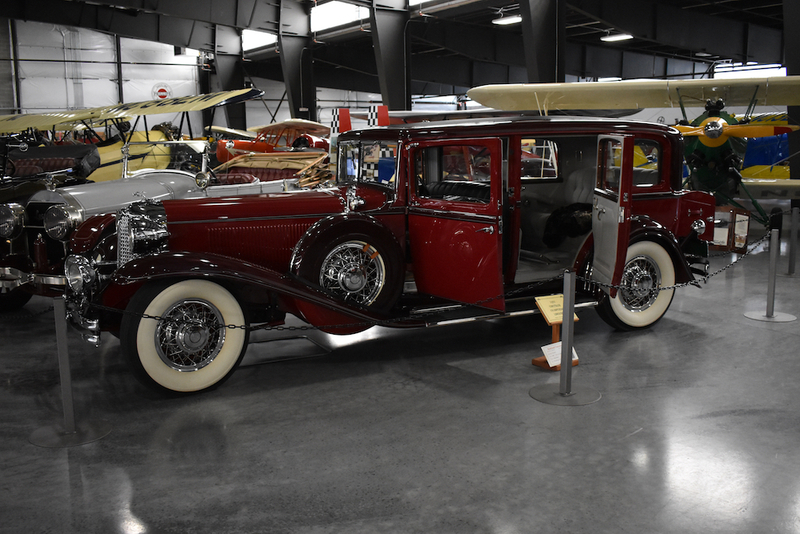 This gorgeous 1931 Chrysler Imperial stops all visitors in their tracks. Painted perfections and polished nickel trim highlight the exterior. Lights on this car left no doubt what the driver in front of you was planning to do. Circa 1931. 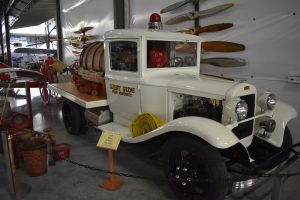 1936 Dodge flatbed converted to a home-made fire truck by the local volunteer fire department. 1936 fire truck water tank appeared to have been surplus from one of the local wineries. If you get a chance, check out this museum. Besides cars the museum decor is everything you can think of from the same era. Vacuum cleaners, bikes, tools and many interesting collections. There are a number of places to sit and relax and there are wheel chairs and electric scooters to rent, as needed. There is something for everyone to enjoy. You will not regret a visit to this treasure of a museum! Nice article and very interesting. Thank you Cindy and than Ed. Your pictures and stories are jus great.